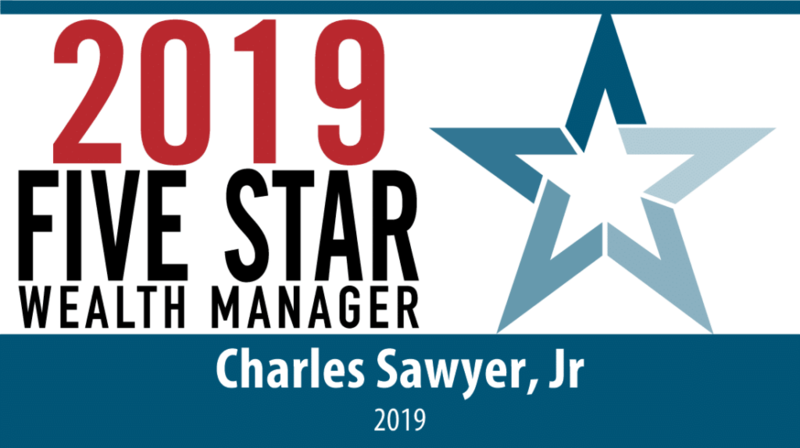 We’re proud to announce that Charles Sawyer has received the 2019 Five Star Professional Award. The award is administered out of Minneapolis, MN, by a research firm, Crescendo Business Services, and uses 10 objective criteria to promote excellence across a variety of professions, including “wealth management,” the category Mr. Sawyer received his award for. Other categories for the Five Star Professional Award include real estate agents, mortgage professionals, and insurance agents. The Five Star Professional award team looks at many factors when deciding who to award their designation to, including the wealth manager’s credentials and history of serving clients. It also requires a clean history with regulatory agencies. Although the award isn’t indicative of a wealth manager’s future performance, it reflects a level of service and objective excellence that sets the wealth manager in question apart from his or her peers. Mr. Sawyer is the founder and managing partner of Sawyer Wealth Management. He has been providing financial planning services to his clients for more than thirty years, and in that time he has specialized in helping pre-retirees, as well as on the complex needs of small business owners. Mr. Sawyer holds FINRA Series 6, 63, 26, and 65 registrations; as well as the CEP® and RFC® designations. He is also licensed in Life and Health insurance. The Five Star Wealth Manager award, administered by Crescendo Business Services, LLC (dba Five Star Professional), is based on 10 objective criteria. Eligibility criteria – required: 1. Credentialed as a registered investment adviser or a registered investment adviser representative; 2. Actively licensed as a registered investment adviser or as a principal of a registered investment adviser firm for a minimum of 5 years; 3. Favorable regulatory and complaint history review (As defined by Five Star Professional, the wealth manager has not; A. Been subject to a regulatory action that resulted in a license being suspended or revoked, or payment of a fine; B. Had more than a total of three settled or pending complaints filed against them and/or a total of five settled, pending, dismissed or denied complaints with any regulatory authority or Five Star Professional’s consumer complaint process. Unfavorable feedback may have been discovered through a check of complaints registered with a regulatory authority or complaints registered through Five Star Professional’s consumer complaint process; feedback may not be representative of any one client’s experience; C. Individually contributed to a financial settlement of a customer complaint; D. Filed for personal bankruptcy within the past 11 years; E. Been terminated from a financial services firm within the past 11 years; F. Been convicted of a felony); 4. Fulfilled their firm review based on internal standards; 5. Accepting new clients. Evaluation criteria – considered: 6. One-year client retention rate; 7. Five-year client retention rate; 8. Non-institutional discretionary and/or non-discretionary client assets administered; 9. Number of client households served; 10. Education and professional designations. Wealth managers do not pay a fee to be considered or placed on the final list of Five Star Wealth Managers. Award does not evaluate quality of services provided to clients. Once awarded, wealth managers may purchase additional profile ad space or promotional products. The Five Star award is not indicative of the wealth manager’s future performance. Wealth managers may or may not use discretion in their practice and therefore may not manage their client’s assets. The inclusion of a wealth manager on the Five Star Wealth Manager list should not be construed as an endorsement of the wealth manager by Five Star Professional or this publication. Working with a Five Star Wealth Manager or any wealth manager is no guarantee as to future investment success, nor is there any guarantee that the selected wealth managers will be awarded this accomplishment by Five Star Professional in the future. For more information on the Five Star award and the research/selection methodology, go to fivestarprofessional.com. 1759 Baltimore area wealth managers were considered for the award; 232 (13 percent of candidates) were named 2018 Five Star Wealth Managers. 2017: 1093 considered, 355 winners; 2016: 1215 considered, 356 winners; 2015: 1749 considered, 412 winners; 2014: 1484 considered, 395 winners; 2013: 1490 considered, 448 winners; 2012: 1470 considered, 262 winners.